Oh, my… Where do I begin? I was digging a hole to build a new fence — I even called 811 before I dug to check for underground utilities. But I certainly found that sprinkler main — and I found it the hard way. I dug my shovel into the ground and seconds later heard a long, loud hiiissssSSSSSSSSS and water started bubbling up from the hole! The water spurted up so quickly from that broken PVC water pipe — it was surreal. Oh gosh… what did I do? Did I hit my house main water service line? I was panicking… I dashed inside to see if I still had water running from my sink, shower, and toilet. Hmm… they were still working. OK, so it wasn’t the house water service line. That’s good, right? But, wait — I’m going to pay through the nose on my next water bill if I don’t stop this leak NOW! I knew that my municipal water service had an emergency shutoff service, but thankfully I didn’t need it. My home, which was recently replumbed, had an emergency shutoff valve on the side of the house. I closed the water valve and, within moments, the gush of water coming from the hole slowed to a trickle — then it stopped. The water receded down into the hole, and about a foot down lay the culprit: a half-inch PVC water pipe leading to the sprinkler equipment not too far away. Enter The Slip Pipe For DIY PVC Pipe Repair! 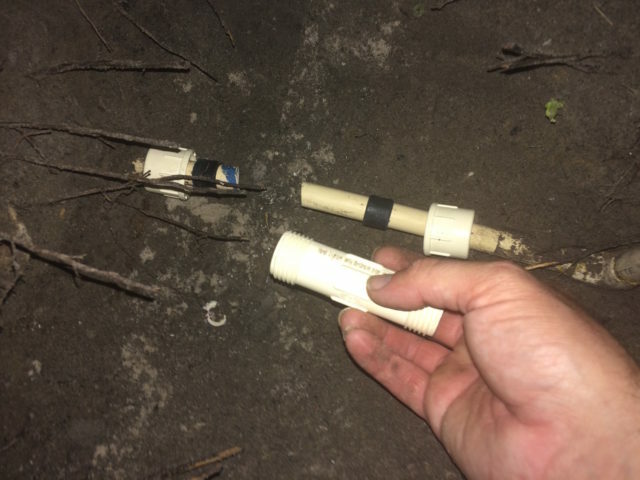 I started researching PVC pipe leak repair hacks online, and I quickly found a video hawking slip pipes and slip fix couplings. What’s a slip pipe? Well, that’s exactly what I researched further. Now, I’m no Norm Abram (you know, the main carpenter on the PBS home improvement series This Old House) — but I’m fairly handy when it comes to light DIY home repair jobs. 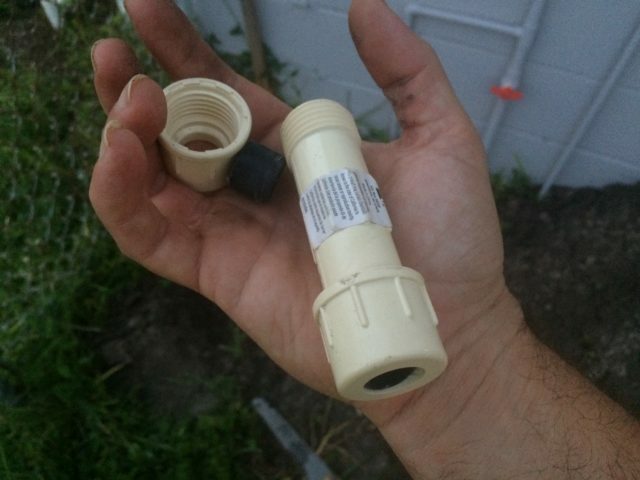 Excited to learn that a slip pipe could do the trick in fixing my broken PVC water pipe, I rushed to the nearest home improvement store just 10 minutes from my home. Finding slip pipes was pretty easy… I just had to get to the plumbing department and look for the pipe fitting display. Be sure you know the difference between CPVC vs PVC pipes! 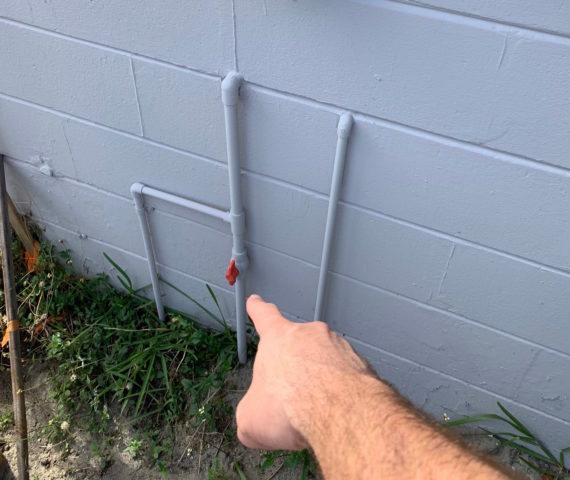 My house has CPVC pipes — which is a newer type of plastic plumbing pipe and requires a different type of slip pipe than PVC pipes do. Have copper pipe? There are slip fix pipes for copper pipes, too! The cost for a half-inch CPVC pipe to do my own PVC pipe leak repair: Only $2.87! It even came with a little pipe thread seal tape to help prevent leaks between the slip pipe and the existing surrounding pipe. Okay… So far, I’m saving probably $100 in material fees from what it would cost to hire a plumber. But what about time and headaches? I drove home just a wee bit nervous about the job that lay ahead. Was I going to create more headaches trying to fix the broken PVC water pipe with a slip pipe myself? On top of that, the sun was setting soon. I wanted to fix my broken water pipe before it got dark outside. Don’t forget, my water was still turned off, and I wanted to get a shower that night after a dirty day of digging holes for my new fence! I carefully read the instructions on the slip pipe carton and re-watched the YouTube video on how to fix a broken PVC water pipe with a slip pipe — it looked easy enough. #1 – I carefully dug a hole around the pipe big enough and deep enough to use my handsaw on the pipe. #2 – I cut the jagged edges off of the existing pipe — using the saw to make clean, straight cuts on either end of the repair. #3 – I sanded off any burs and sharp ends from the edges of the pipe and cleaned the existing pipe to remove dirt, water, and other debris. #5 – I then took the main section of slip pipe with its threaded ends (onto which the couplings screw) and pushed it into place to bridge the gap on the broken pipe that was created when I sawed off the jagged ends. #6 – I screwed the couplings on either end of the broken buried pipe onto the main slip pipe segment. #7 – I turned the house’s main water supply line back on and said a little prayer. I carefully watched the PVC pipe repair as water began coursing through — no leaks! The slip pipe worked in fixing my broken PVC water pipe! Thankfully, it was only a cold-water irrigation line — nothing critical and really one of the easiest types of DIY pipe repairs to make. What do you do if you have a broken hot water pipe, house main, or another type of broken pipe? You’ll need to assess the pipe repair individually. Yes, there are DIY pipe repairs for hot water pipes, house main supply pipes, drain pipes, and other types of pipes. But beware these will involve more complicated preparations to ensure the repair is made correctly. And you might need to shut off not just the water supply, but perhaps also your home’s electric supply, gas lines, and other utilities. When you start getting involved with electricity, gas, and sewer lines, you might be better off (and safer!) calling the professionals. Also… some broken pipe repairs may require the service of a professional so as not to void your home warranty, warranties for certain appliances and fixtures, or even your homeowners insurance! I know this because a close family member recently had to call a licensed professional plumber for what seemed like a simple drain pipe repair. Otherwise, she risked losing her homeowner’s insurance. Of course, you’re proceeding at your own risk with any and all DIY repairs for broken pipes — even if you’ve read the tips here in this article. But if you’re feeling confident and the pipe repair has relatively low-risk consequences, perhaps you might save yourself a few bucks by fixing the broken pipe yourself.